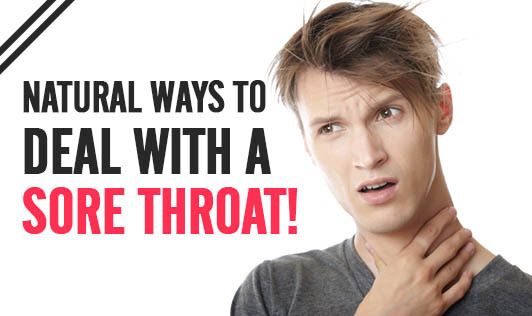 Natural ways to deal with a sore throat! Sore throat is a common ailment. When it's cold, we turn up the heat which dries the air and can result in dry nasal passages and a sore throat, even in summers. Air conditioning in humid regions can dry out your throat and produce the classic sore throat. Your throat may feel itchy, tender, swollen and you dread the simple task of swallowing. • Nothing beats the old fashioned saltwater gargle. Salt acts as a mild antiseptic which also draws water out from the mucous membrane in the throat, which helps to clear the phlegm. Take a tea-spoon of salt in a glass of warm water, gargle and spit it out. Repeat up to four times a day. • Use a humidifier in your bedroom. Adding moisture to the air will help keep the air from drying out and prevent the lining of your throat from becoming dry. • Honey is also used as a sore throat remedy. It has antibacterial properties which can speed up healing. It reduces swelling and discomfort. Add several teaspoons of honey to a hot cup of water or herbal tea. • Dried garlic has potent antibacterial and antiseptic proprieties to fight off infection. Whatever you do, don't ignore a sore throat that lasts longer than a week. If you have severe pain and you're unable to swallow, contact your doctor!